“Ugh, I’ve come on.” Those dreaded few words that you don’t want leaving your mouth until that time of the month strikes. For those fatiguing few days of menstruation, you lose the focus and ability to do the simplest tasks as you’re weighed down by your womanhood. But imagine periods for Indian women living in rural villages where they’re chastised by their families and disentitled to the comfort of their bed for being on their time of the month, deprived of their education and additionally, without access to sanitary products. 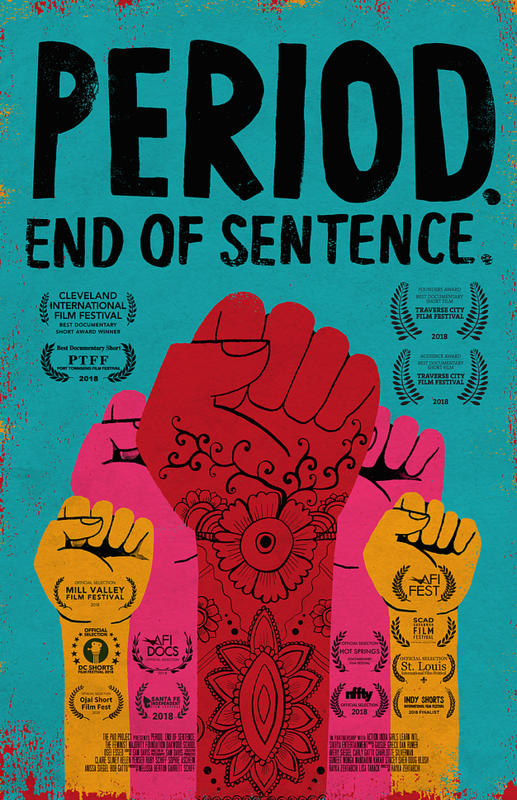 In February 2019, Netflix released a female empowering 20-minute documentary entitled Period. End of Sentence, which won Best Documentary Short at the Oscars. 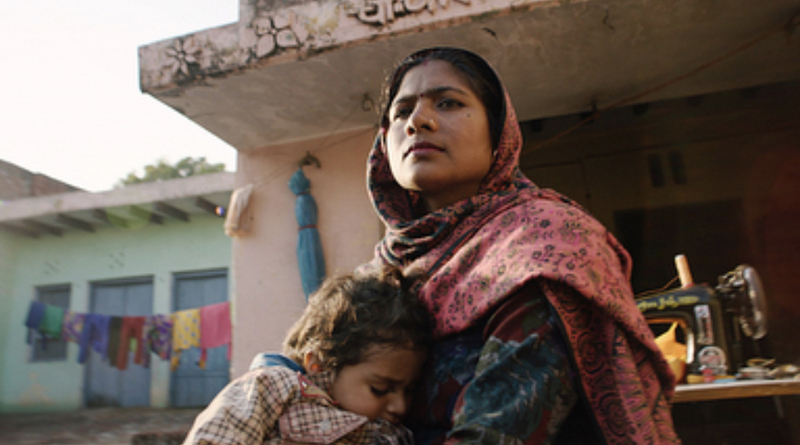 The Hindi (and part English) film detailed the plight of Indian women living in a rural village, Kathikera, located on the outskirts of Delhi and how period poverty can be prevented through the installation of pad machines. Award-winning film-maker Rayka Zehtabchi partnered with The Pad Project; a Californian non-profit organisation which consists of a high-school teacher and producer Melissa Berton and a group of her public-spirited students from Oakwood School. The Pad Project’s leading objective is to ignite awareness on how period poverty in developing countries can restrict girls from achieving their education. Melissa is an English teacher at Oakwood School in Los Angeles, and also the faculty sponsor for Girls Learn International (GLI). GLI is a nationwide organisation under the auspices of the Feminist Majority Foundation that is dedicated to giving high-school students a voice in the global movement for equal access to education. “We also knew that the most authentic and most powerful advocates for such a film would be high school girls themselves.” The documentary unveiled how embarrassed women and young girls got when questioned about their periods and how they found disposing of their sanitary pads in landfills with men hovering around uncomfortable. Furthermore, it pressed on the subject of how women from poverty-driven areas are, from childhood, not being correctly educated about their menstrual cycle or hygiene, and the misconceptions surrounding it, unlike in the UK. According to a National Family Health Survey (NFHS) report published in 2017, only 58% of women in India aged 15 to 24 use a hygienic method of menstrual protection. Young girls and women are left with no choice but to use any cotton cloth available, clean or dirty, or even leaves or ashes in place of a sanitary pad. This germ-infested practice can further cause dangerous bacteria to invade the genital tract and cause Reproductive Tract Infection; a breeding ground for toxic bacteria like Salmonella, Staphylococcus and E.coli. It can also trigger pelvic, urinary and yeast infections, Hepatitis B infection and increase the risks of cervical cancer. Furthermore, not changing sanitary pads frequently throughout the day can contribute to moisture retention and quicken the growth of harmful microorganisms. These potentially detrimental consequences are unheard of to many women. Deemed ‘dirty’ and ‘impure’, the menstrual cycle isn’t widely and openly articulated in out-dated, rural communities. This factor plays into why women are forced to sleep outside their rooms when menstruating, and in certain cultures, they’re ostracised from entering into Hindu temples and cooking for the family in fear of contamination. According to a study published in 2011, only 12% of Indian women have access to sanitary pads and subsequently, genital infections are 70% more frequent for these women. This is partially due to the prohibitive costs of sanitary pads. Sanitary pads are categorised as ‘luxury goods’ which come with 12% tax. This is after the Indian government rolled out a fiscal reform at the end of May 2018 that added tax to certain products based on their usefulness, called the ‘Goods and Service Tax (GST)’. The 12% tax counts towards the economic divide which is heavily present in India; it exploits the poor and further contributes to the calamitous problem of impoverishing women and denying them access to affordable sanitary pads. The government’s discriminatory attitude was met with outrage as condoms and other contraceptives were not being taxed on. Suhsmita Dev, a Congress MP, launched a petition against the sanitary products tax, which accumulated 300,000 signatures. Indian women on social-media used the hashtag #LahuKaLaagaan (tax on blood) to retaliate and spread injustice on the recent tax with the argument that sanitary pads should be considered a necessity, rather than a luxury. “A period should end a sentence, not a girls education.” is the motto of The Pad Project. 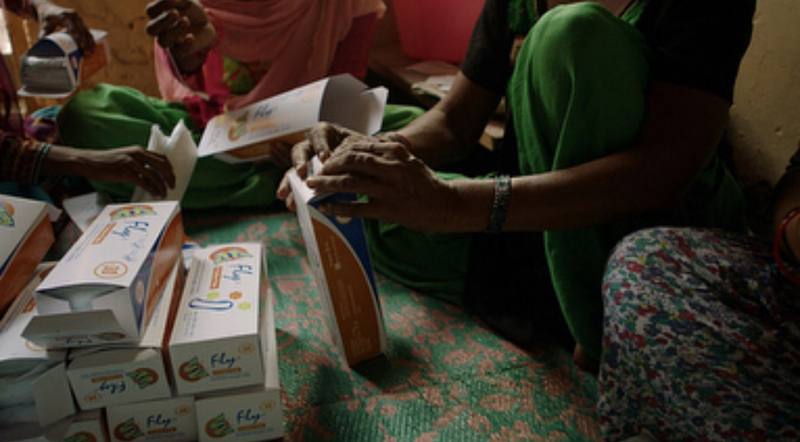 The Oscar-winning documentary covered the causal issue of young girls hindering their education because of the infections caused by unhygienic alternatives to sanitary pads. Between 25% and 57% of adolescent girls miss school or drop out completely. A girl’s key to success in a patriarchal society is heavily reliant on their education, and it shouldn’t be stripped away because of the taboo surrounding a natural process. If these young girls receive seven full years of their education, they’re in a likely position to marry an average of four years later and have 2.2 fewer children. This stimulated the Delhi government’s Department of Health to provide a pack of sanitary pads to 50,000 girls per month at subsidised rates. In their bid to help adolescent girls living in slums to overcome potential health risks, the ‘Menstrual Hygiene Scheme’ will be implemented next month and its focus is ensuring safe disposal of sanitary pads, improving access to high-quality products in rural areas and providing funds to Asha workers to configure monthly gatherings with young girls to discuss the importance of hygienic menstruation, and issues relating. Period. End of Sentence also introduced Indian entrepreneur Arunachalam Muruganantham. In 1998, this doting husband, fearing health implications for his wife for using a soiled rag during her periods, invented the low-cost sanitary pad-making machine in a village in Tamil Nadu, south of India. Arunachalam, also nationally recognised as the ‘Padman’, has been able to manufacture sanitary pads for less than a third of the cost of commercial pads and has been credited for generating awareness surrounding traditional unhygienic practices of menstruation in rural villages. His mini-machines have been installed in 23 of the 29 states in India. Arunachalam’s quest was later turned into the 2018 Bollywood film ‘Padman’. 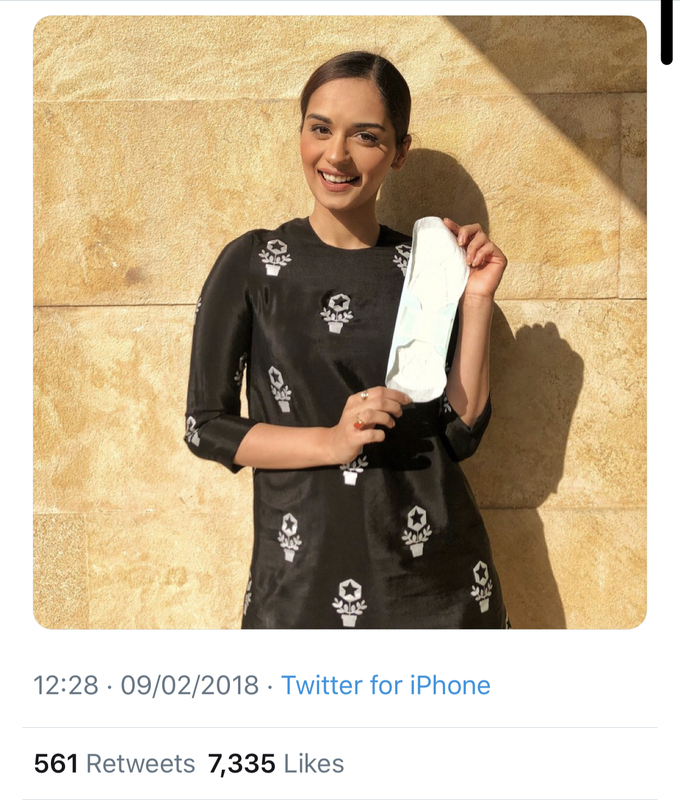 A number of Indian celebrities partook in the #PadmanChallenge holding sanitary pads in pictures posted on social-media to destigmatise the narrative of menstruation cycles. The Oakwood students involved in The Pad Project embarked on a philanthropic fundraising journey to fund for the pad-machine and its supplies for the village women living in Kathikera; by holding vegan bake sales, yoga-thons and two successful Kickstarter campaigns. “Because of Delhi’s relative proximity to Muruganantham’s factory, we determined that Kathikera would be the best village to house the machine, where women were eager for the opportunity,” Melissa adds. The women were schooled on how to manufacture and market their innovative product, which they labelled ‘Fly’ because they wanted women to “soar”. They retail a pack of six sanitary pads at a bargain price of 30 Rupees (30 pence), which means each ‘Fly’ employee brings home 2,000 Rupees (£21) a month after working eight hours a day throughout the week. The deep-rooted stigma surrounding menstruation has slowly started to disintegrate as women are leading a quiet revolution by claiming their right to bleed freely without feeling the weight of society’s judgement. The pad-making machines have opened prospects for village women all around India by creating jobs and incomes so they’re able to earn their livelihood, become businesswomen and financially dependent on themselves. The future is Indian women empowering one another and owning their bodies; from their right to be vocal about menstruating, to not feeling embarrassed about mother nature doing its job every month. “The world can’t go ahead without women. We are the creators of the universe,” one village woman commented in the documentary, and she couldn’t have said it better. Period. End of Sentence is being screened on Netflix.com. For more information on The Pad Project, please visit https://www.thepadproject.org. Featured Image from Netflix’s documentary Period. End of Sentence.